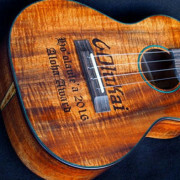 Here’s a new tenor ukulele made from salvaged Dark Koa with Plumeria Flower Inlay. 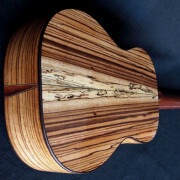 With this salvaged wood source I sometimes don’t get the absolute best quality Koa Wood and this is a perfect example: the curl is not consistent across the entire face of the instrument and there are a few blemishes. Really! I just thought you might be interested. This is a perfectly good piece of wood and provides, in my opinion, much more visual appeal than some of the straighter pieces of wood. 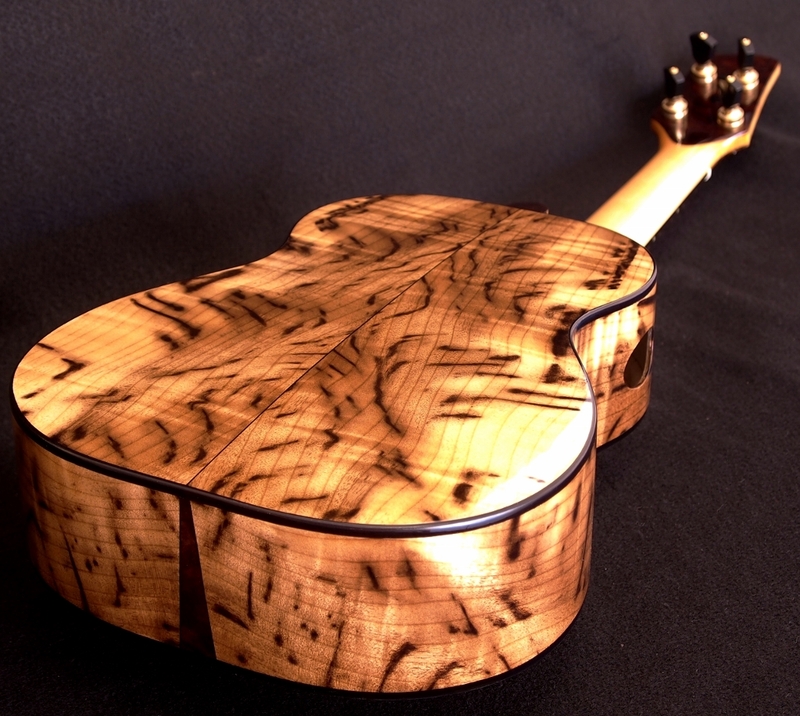 I feel lucky just to get such fun pieces of wood to work with. 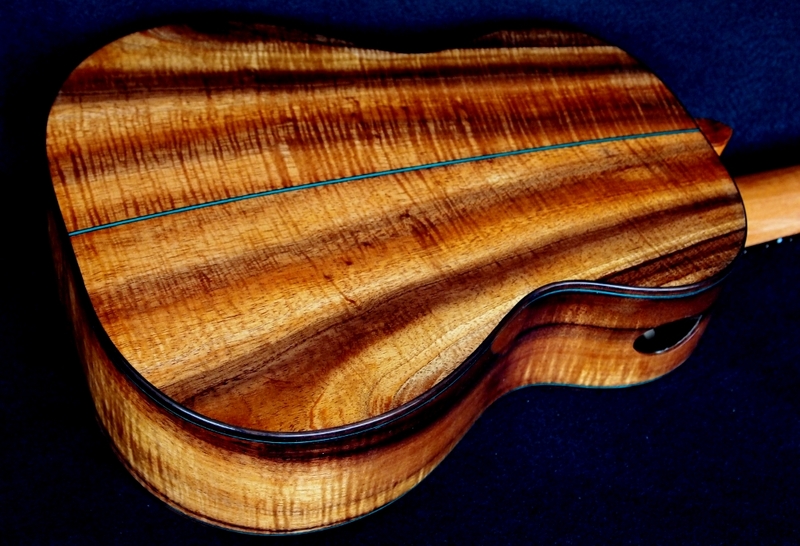 Even with conservation and replanting, the demand for Koa Wood does not seem to be sustainable at the present, so using reclaimed or salvaged wood is a perfect fit with my builds. I love the look of all the wood that I use. I can’t say that I favor light or dark in appearance but I do think this combination provides interesting visual contrasts. 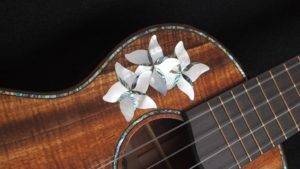 The Plumeria Flower Inlay has been one of my designs for a long time now. This is just a revitalization of my original design done in solid Mother-of-Pearl and Paua Abalone. I’ve also used Paua Abalone for sound board accents. The rest of the instrument is fairly standard: the accent wood is Vanuatu Maidou Burl, the binding is East India Rosewood with Green/black accents, the neck is Honduran Mahogany, the finger board and bridge are Ebony Species. Of course, Gotoh planetary tuners and I am presently using a custom set of GHS flourocarbon strings utilizing Sarah Maisel’s low “G” from her custom string set. 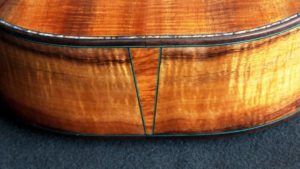 I use a modified X-bracing on the sound board and recently have had the opportunity to compare this with the sound of one of my older instruments where I used the classic 3 finger braced pattern. 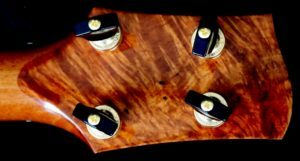 The X brace instrument is providing more volume and a much more complete sound than the finger braced sound board. I’m glad I made the change. 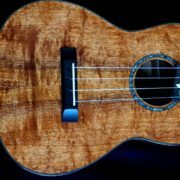 This instrument can be seen and played at Hale Ukulele in San Diego.